"The Earth Observatory is a website run by NASA's Earth Observing System Project Science Office (EOSPSO). Bringing together imagery from many different satellites and astronaut missions, the website publishes fantastic images with highly detailed descriptions, feature articles and more. Gathered here are some standout photographs from the collections in the Earth Observatory over the past several years." The VCA who murdered four police officers in Oakland, CA last Saturday had been incarcerated since 2002, but had been recently released on parole. Now there’s a real recommendation for parole! That report was surely available to the Parole Board who let him out. Perhaps, between shrieking for the end to the private ownership of guns in America and the need for higher taxes, the media might find the time to ask why such remorseless, violent, unstable sociopaths are paroled in CA! "An Italian doctor completed a brain operation despite having a heart attack after realizing his patient would never recover if he stopped the surgery." California to reduce carbon emissions by… banning black cars?! Carbon emission hoo-haa + nanny statism = government run amok. 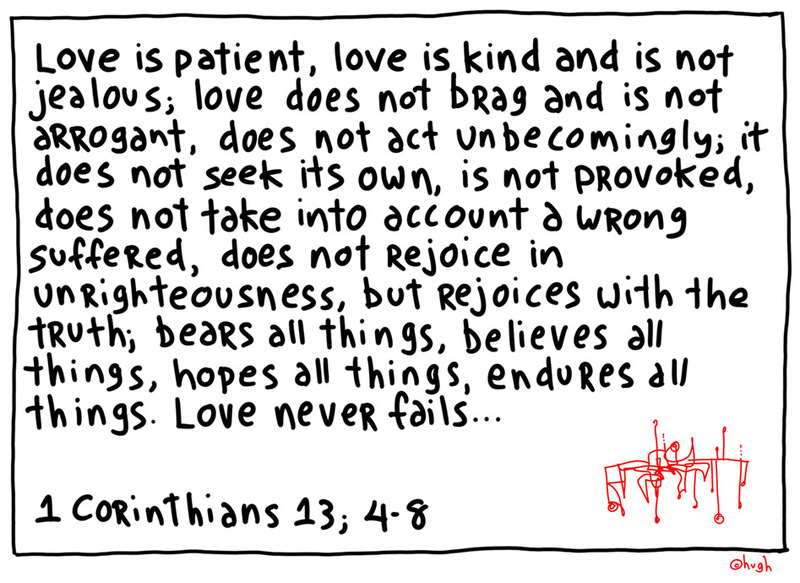 1 Corinthians 13:4-8, as rendered by Hugh Macleod. A gem my friend Tom found while out and about. Joshua Trevino accurately sums up most of my feelings regarding the series, and the finale. "Why not? What could happen?" "WRITERSBLOK is a new set of notebooks and stationary products aimed at encouraging the activity of writing. We'll give you the basic tools and you take them wherever you want. The possibilities are endless. Best of luck. Let us know how it goes. "A percentage of sales from WRITERSBLOK goes to literacy-related programs around the country." Quite possibly the best LOLcat EVER. I have the LOLcat web site’s RSS feed in my feed reader. I don’t read it every day, but there are days when I’ll get caught up on the past week or two’s worth of photos. This one made me snort water through my nose.